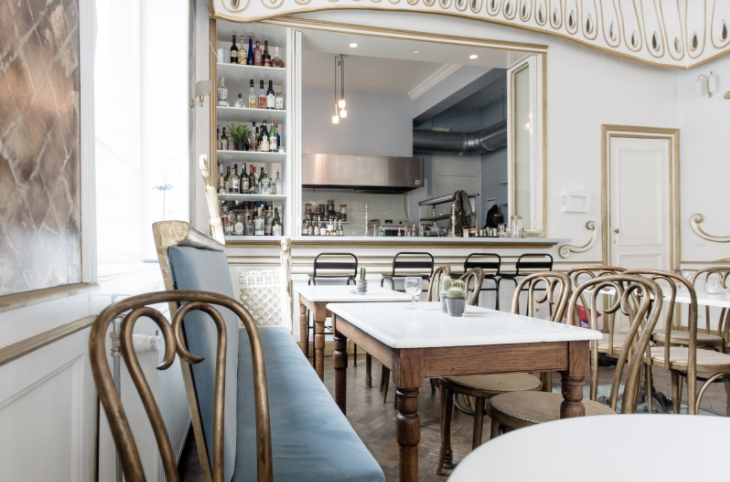 In early 2017, gastronomical wunderkinds Nicolas Decloedt and Matthieu Chaumont joined forces to open the doors of Hortense & Humus, an upscale-feeling yet reasonably priced restaurant that seems poised to become a Brussels showpiece. In early 2017, gastronomical wunderkinds Nicolas Decloedt and Matthieu Chaumont joined forces to open the doors of Hortense & Humus, an upscale-feeling yet reasonably priced restaurant that seems poised to become a Brussels showpiece. While Decloedt busies himself in the kitchen by making light veggie dishes that could turn a brown bear vegetarian, French mixologist Chaumont whips up original cocktails and mocktails infused with homemade syrups. The food-cocktail couplings are well thought out, and lending even greater harmony to the experience is the setting: a pastel-colored former teahouse with a Sistine Chapel-esque ceiling, luxurious but never gaudy.